This section contains information related to Dba, flight code DI, a low-cost carrier regional type. 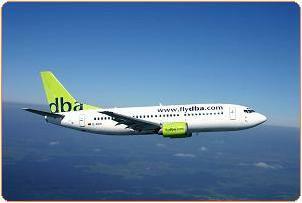 "Since 1992 Dba started competition in the German domestic air traffic market. The second largest German domestic airline carries over 4 million aircraft passengers per year. The enterprise employs approximately 700 coworkers. The headquarters has its seat at Munich airport." Click to view the company history in a new window (German). Click to browse to the network development section of this site, featuring more more information on the network development of Dba.